Note from Michael: the following information was provided by the merchant. Attention green businesses, do you have a special coupon or discount offer you’d like showcased on Green Living Tips? Learn more here. My name is Meredith Roberts and I am the owner/president of Mere’s ATLAST! Organic Products. I make ATLAST! Fly Spray and ATLAST! Flea and Tick Spray. Both are 100% organic and the basis of ATLAST! is cedar oil. Cedar products have been a proven repellant for hundreds of years. In fact, the Egyptians used to dip their cloths to wrap the dead in cedar oil to ward away the bugs. There are cedar chests and closets that repel insects which are based on the same approach. Cedar oil has been approved by the Environmental Protection Agency as a minimum risk pesticide since 1996. ATLAST! Organic Products – for your horses and your pets! “Green Living Tips” and save 10% on your next ATLAST! product. ATLAST! is the perfect earth friendly insect repellent solution. You can even spray it on yourself! It repels flies, mosquitoes, gnats, ticks, mites and fleas on your horses, foals, dogs, cats and other pets – including newborns( excluding reptiles ). Even the bottles we use are recyclable! We at ATLAST! we also like to give back to the community. A portion of the profits from ATLAST! Fly Spray goes to horse protection agencies and a portion of ATLAST! 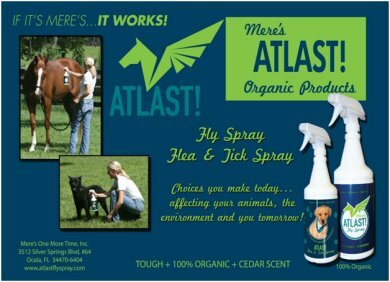 Flea & Tick Spray profits go to humane societies. ATLAST! is the perfect alternative to spraying your loved ones with harsh chemicals! ATLAST! is pyrethrin free and 100% organic.